When the nerve of a tooth is no longer alive, in order to save the tooth itself, a root canal procedure must be performed on the tooth. The most common cause of a non-vital nerve in a tooth is from tooth decay; however sometimes, either through an injury such as a fall, being hit in the mouth by something hard, a car accident, or a fracture in the tooth, damage to the living tissue inside a tooth (the pulp) can occur, and the nerve of the tooth dies. Harmful bacteria that cause tooth decay can break through the outer shell of your tooth and open a cavity. If the tooth is not treated promptly, the decay will continue toward the pulp of the tooth, which will cause the pulp to swell irreversibly, causing the pulp to become non-vital. If root canal treatment is not performed at that time, it will result in an infection that may cause an abscess. If the abscess is left untreated, it can become quite painful and the infection could spread to the surrounding bone, affecting the surrounding teeth as well. In severe cases, this infection could enter the blood stream, which can cause severe health issues that could even require hospitalization. If the pulp (nerve and blood vessels) of a tooth becomes infected or extremely swollen and painful, root canal therapy allows a person to retain their natural tooth while removing only the infected or swollen nerve, eliminating the source of pain. The dentist will evaluate the tooth visually and with X-ray images, and will test the tooth in various ways to determine the severity of damage to the tooth. If it is necessary, the dentist will access the pulp tissue through the biting surface of the tooth to remove the swollen or non-vital pulp. 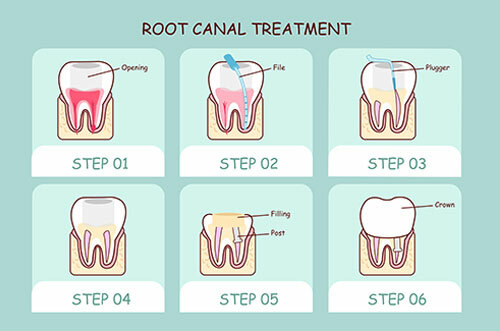 The root will then be permanently filled with special material so that the root canals themselves will be protected from re-infection. The pulp is usually accessed from a single point on the tooth on the biting surface, and then repaired with filling material. Teeth that have root canal treatments completed no longer have an active blood supply, which do cause the treated teeth to become brittle with time. In order to protect the tooth as much as possible, a restoration that covers the entire tooth, such as a crown, is the best option to maintain the health and integrity of the tooth in the long term. While it is possible to seal up a tooth with direct filling material, only a restoration that covers the entire tooth, such as a crown, is comprehensive enough to withstand all of the different biting and chewing forces that any tooth receives throughout each day. To learn more about dental crowns, please visit our page on dental crowns, where we have a detailed explanation of what dental crowns are, as well as how they work. Contrary to urban legend, root canal therapy is quite similar in many respects to a regular filling procedure: there is usually no pain experienced during a root canal procedure, as the tooth is anesthetized (“frozen”) before starting the procedure, and feeling in the area is usually gone for 1-2 hours. Soreness can sometimes be felt after the procedure, but is easily managed with prescribed or over-the-counter analgesics (pain-relieving medicine). If you feel that any of these issues may apply to you, schedule a consult at Albion Dental Office by calling (416) 749-9732, and Dr. Trotti will be happy to discuss any concerns you may have.